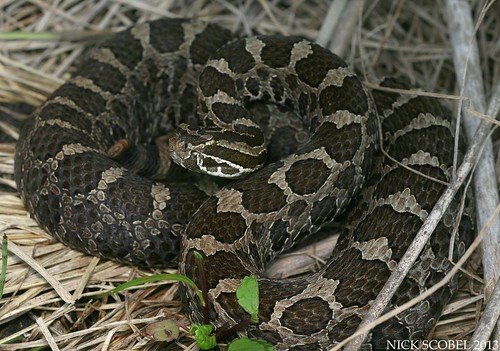 As the summer drags on in Michigan, the herping begins to slow down before picking back up once again in the fall. This usually leaves me feeling unmotivated to go out and look for things I know I'm likely to strike out on. So what's the best way to beat the dog day doldrums? Paddle! 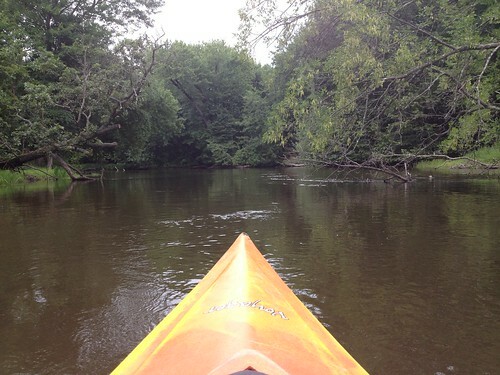 I arose early one morning and met Jason Folt for a day of turtling on one of Michigan's northern rivers. After a three hour drive we arrived at our location and were quickly on the water. Our trip would take more than four hours and cover more than twelve miles. The weather for the first hour of our paddle was cool and overcast, not great conditions for turtles to be out. We noticed a few Northern Map Turtles (Graptemys geographica) trying to warm themselves on fallen logs, but the species were after did not make an appearance. 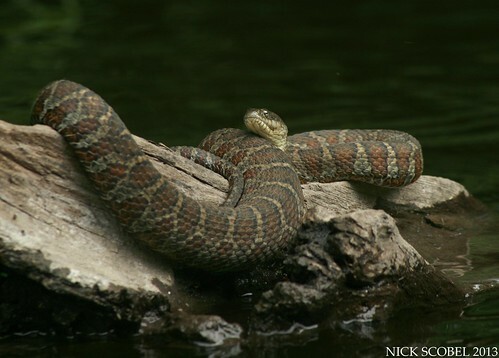 However, we did notice several large water snakes basking along the way. 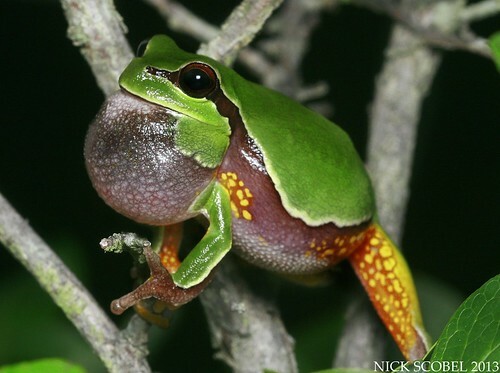 Many appeared to be large gravid females, like the one shown above. 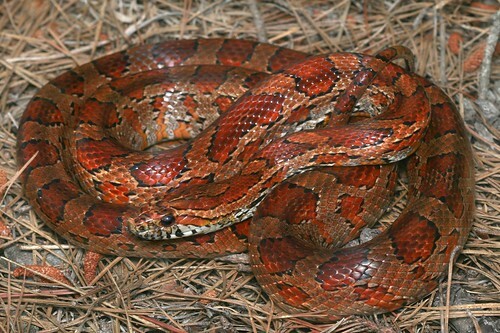 Water snakes appear to be particularly abundant on this river and many exhibit brilliant red coloration. About halfway through our tip the clouds began to break and the sun came out. 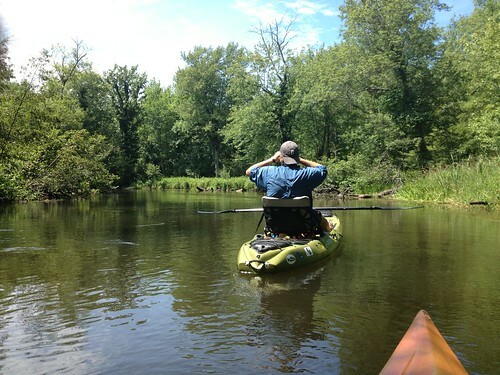 Here's Jas sporting his turtling rig, a Coosa fishing kayak made by Jackson Kayaks. 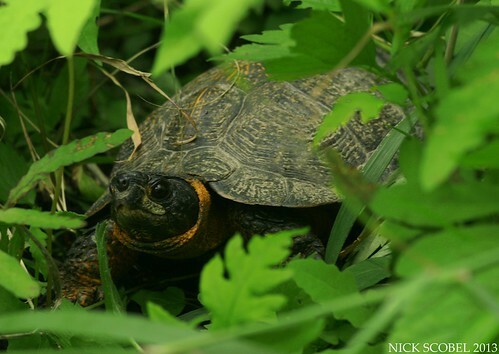 Wood turtles can be particularly difficult to spot when they bask because they often the select river banks with heavy grass cover. Our first wood turtle on this day exhibited this well, as Jason spotted him a few feet back on the bank peeking out of a thick patch of ferns. 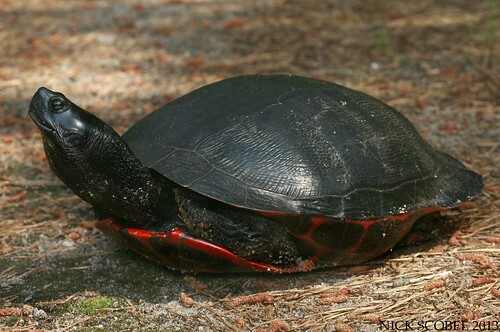 Wood turtles are semiaquatic, meaning adults spend just as much time on land as they do in the water. They can often be found foraging near berry patches in the late summer. 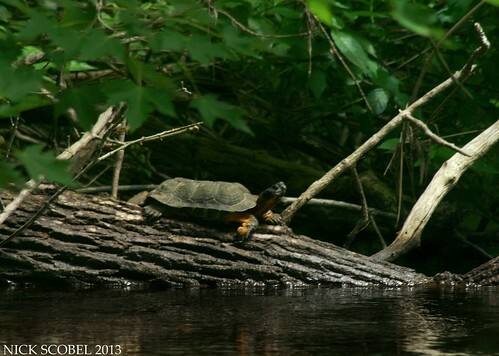 We were excited to finally get a wood turtle after a few hours of paddling, and the sun proved to be what we needed. A short distance from our first wood I spotted a second individual basking in the open. We portaged our kayaks and waded out into the river to snag a few long distance shots. The turtle quickly dropped into the water as we tried to move closer for a few shots. It seems as this is how paddling for this species goes, often a few individuals are found in quick succession followed by long gaps of nothing. 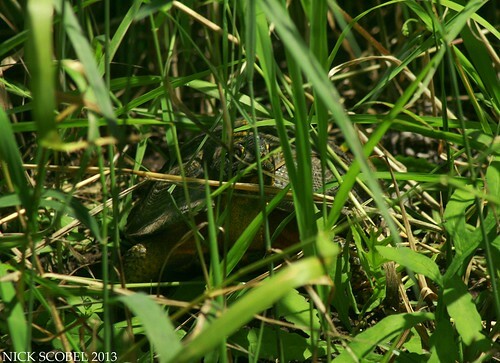 It was about another four before we saw our next wood turtle, Jason spotted it basking in thick cover on the river bank. We were able to wade across the river and fire some shots fairly close to the bank and let him be. We finished our paddle trip with three wood turtles, more than forty maps, and a few painteds. After getting back to the car and loading up the kayaks, we decided to poke around the area for a bit. The first place we stopped was nice sandy field with lots of debris and logs. We thought it looked like a good place for hogs and racers, but Jason flipped an awesome little surprise under a rotting log. This was an incredibly exciting find. Most of your are probably scoffing at that last statement, a ringneck is exciting? This species is incredibly common to the south of Michigan in states like Ohio, Indiana, Illinois, etc, but seems to be uncommon and local in Michigan. The only other time I've seen one was out on the Beaver Island archipelago in Lake Michigan, where they can be found in large numbers. 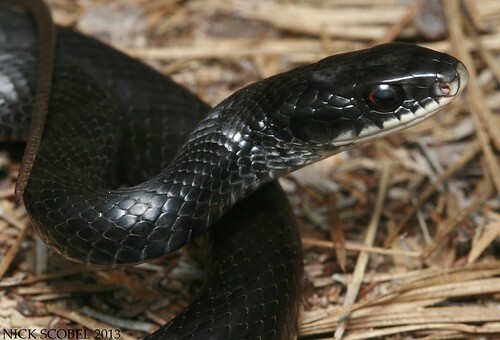 Ringnecks spend much of their time under debris where they hunt Redback Salamanders (Plethodon cinereus), a staple of their diet. 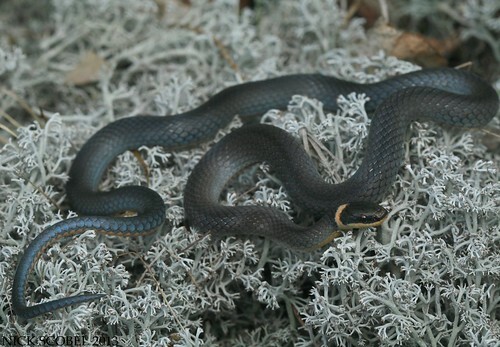 It's unclear as to why this species seems to be so absent from much of Michgian's northern lower peninsula but is extremely common on some coastal islands. Either way, my first mainland ringneck was exciting. It was a great way to finish up a nice day trip, I look forward to more excursions on the water as the summer begins to draw to a close. We've reached the dog days of summer here in Michigan and the temperatures have soared in the past few weeks to the high 80s and low 90s. With lots of afternoon thunderstorms,the weather has not only been hot, but also extremely humid. 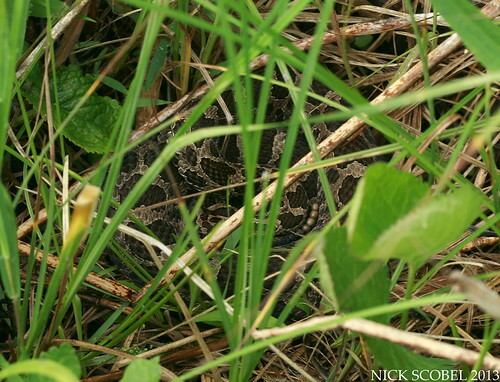 This understandably has made finding snakes incredibly difficult during the hottest parts of the day. 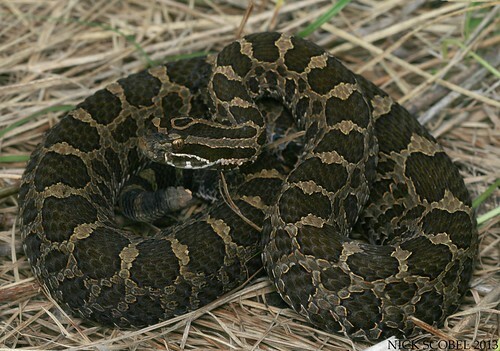 Since the end of May, I've been keeping an eye on a few individual snakes which have selected a prairie fen as a rookery for the summer. 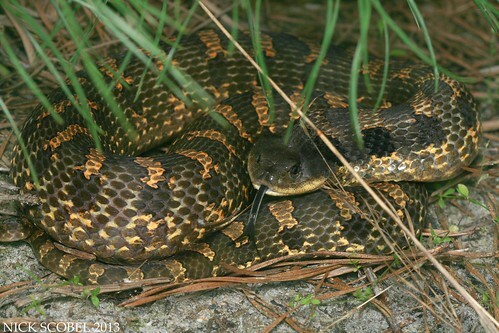 My first encounter with one of these snakes was back in late May on muggy, overcast afternoon. This large female is one I've come to know fairly well over the past four to five years. She regularly spends her summer months in a small open meadow adjacent to a tamarack swamp. She gave birth to at least a dozen neonates in the summer of 2011 in that small meadow. It appears that she is once again heavily gravid this summer, but she's decided to utilize this open prairie fen instead of the small meadow which is a short distance away. 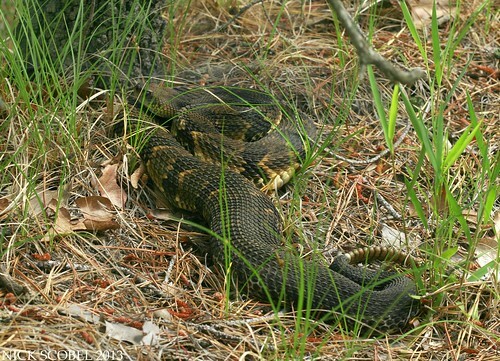 She's a big snake, probably just over thirty inches in length, and heavy bodied. You can see in the video below how heavy bodied she is, and is noticeably dragging her back end due to a full load of developing neonates. I've tried to limit my visits to once every few weeks to disturb the snakes as little as possible, and no snakes were handled in any way. I returned a few weeks later with my cousin and Chris Boguslawski and Robbie spotted the same big girl coiled in the open in the early evening. She had clearly shed her skin recently and was boldy colored. While we were walking out of the area, Robbie called out that he had two more snakes right next to each other. We ran over to an area where some deer had clearly been bedding at night and found these two screamers coiled side by side. Both appeared to be gravid females and were heavy bodied, though they were nowhere near the big snake we had seen just minutes before. 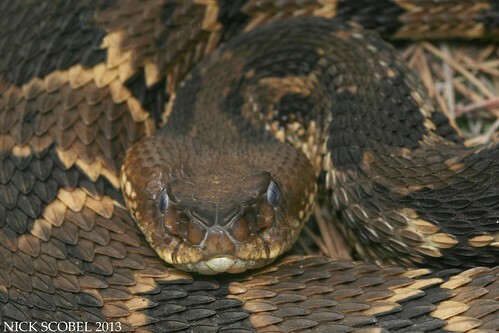 The snake in the top of the photo quickly bolted into thicker cover while the one in the lower half coiled defensively and sounded her rattle for a quick photo session. This particular female boasted a beautiful golden brown coloration which didn't come out real well in these photos due to the evening lighting. I saw this snake this snake a few weeks later in the early morning hours and her golden color was much more apparent. After a few photos, we parted ways for the day. About two weeks later, I returned one early morning after a night of heavy thunderstorms to see who was hanging around the area. The sun was shining weakly through the hazy skies due to the high humidity and was perfect for snakes to be out basking before 9 AM. As I was walking through the area, I noticed a dark shape coiled in the sedges and spotted this female, the same snake that had been found side by side with the golden female a few weeks earlier. 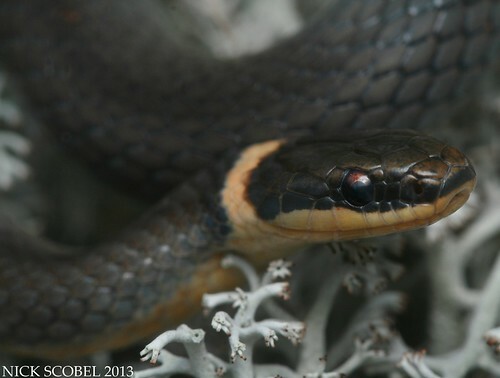 I gently pulled back some of the sedges and fired a few up close shots of this snake, she never moved a muscle. During the first week of July my family took a trip to Michigan's Upper Peninsula; which I'll detail in a later post, and I didn't have time to return to the fen until the second week of the month. With an impending heat wave on the horizon, I arrived early one morning before nine o'clock to see if anyone was out. While walking around a section of brush piles, I noticed the golden colored female basking in a concentric coil on one of the piles. The following photo is in situ. 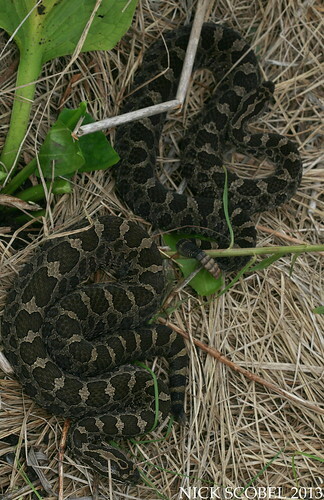 Gravid female rattlesnakes often select rookery sites with ample basking locations, but also consider thermoregulation as a factor. 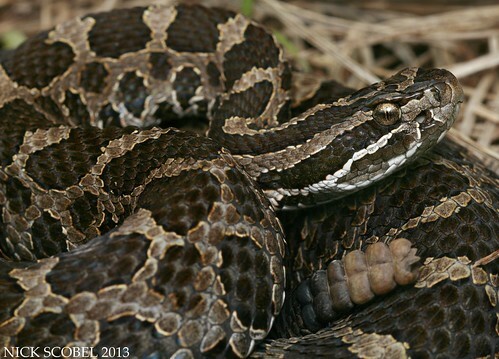 In this case, the brush piles appear to be superb thermoregulatory locations as they provide open, sun lit areas for basking and also give cover that the snakes can retreat back into when temperatures become too hot. This individual and the big female from the beginning of this post have been seen in close proximity to this area on several occasions this summer. Then, this past weekend I went out one morning with Chris to check out the area. Chris beat me to the location and mentioned he had seen two snakes up basking within few feet of each other and he thought they were two we hadn't seen before this summer. By the time I arrived, one of the snakes had gone into cover for the day, but this gorgeous gray female was found coiled near the base of a large tamarack. 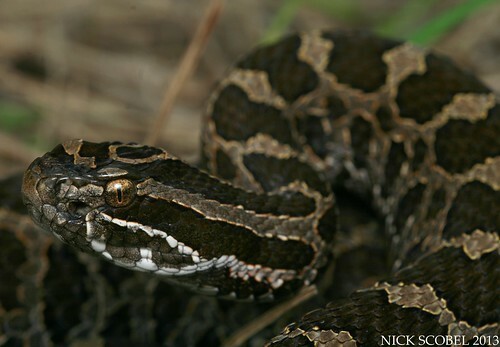 The two unique spots between the saddles of this snake indicated it was one we had not seen so far this summer. She was heavily gravid just like all of the other snakes utilizing this area. We snapped a few photos and cleared out as the temperatures were rising into the high 80s already on this day. 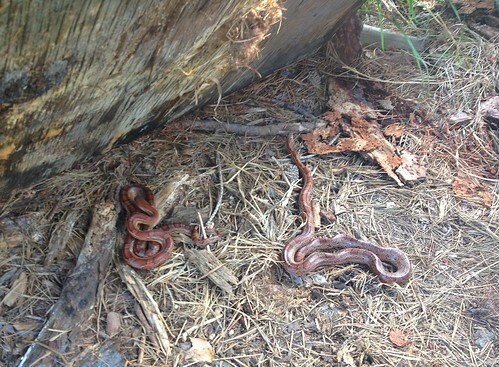 I returned early on Monday morning in hopes of seeing the second snake Chris had mentioned. Walking carefully through the area, I noticed the same snake pictured above laid out on a fallen tamarack in the dappled morning sunlight. As I was walking away from the snake, I spotted a second gravid female just a few feet away as you'll see in the video below. 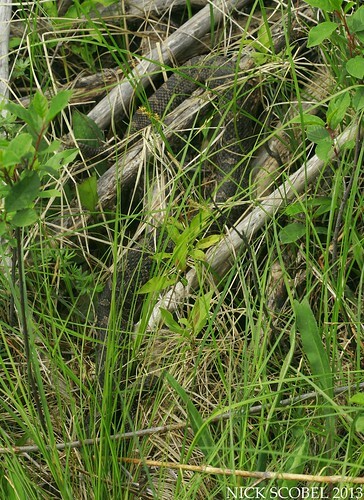 I didn't disturb either snake and continued on my way out of the fen. While I was nearing the entrance of the site, I spotted this lovely snake coiled out in the open. She never rattled, but just simply raised her head to see what I was doing. After working in New Jersey from 2011-2012, I had the opportunity to return to the Garden State for a four day weekend.. I arrived just as tropical storm Andrea did, and she dropped more than four and a half inches of rain locally in northern Jersey. The first day of my rendezvous with former coworkers was spent inside going over data that had been collected earlier in the spring, and I wasn't able to go out in the field to see the two turtle species I had spent so much time with the previous two summers. The weather forecast for the weekend was more pleasant, and so I arose early on Saturday morning and drove to one of my favorite places to be in the field, the pine barrens. 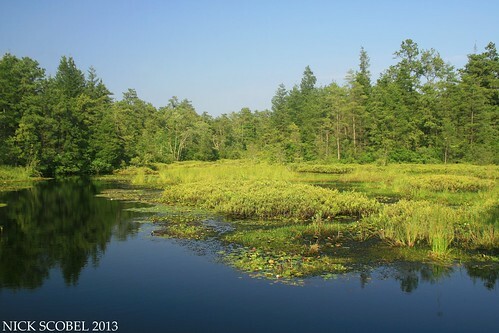 This large tract of coastal plain pine forest makes up almost a quarter of New Jersey's total land mass and is home to many unique species of reptiles & amphibians. When I reached the northern part of the barrens, I made a pit stop at one of the best things about Jersey. 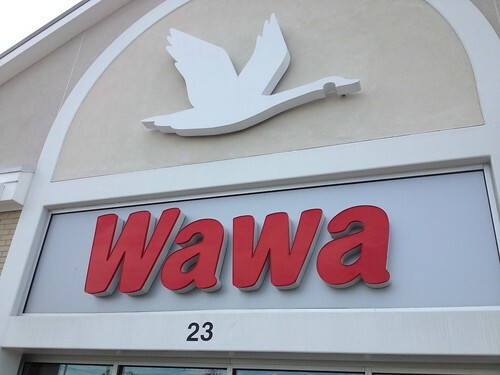 What is Wawa? Well, it's like 7/11, but on steroids. It is a chain of convenience stores which can be found in New Jersey, Pennsylvania, and other scattered locations along the east coast. Most are combination food stores and gas stations, which make them a great place to stop at fill up on food and fuel. They offer freshly made hoagies, salads, wraps, juices, and just about anything else you can think of. After grabbing a chicken caesar wrap and some juice, I was on my way. 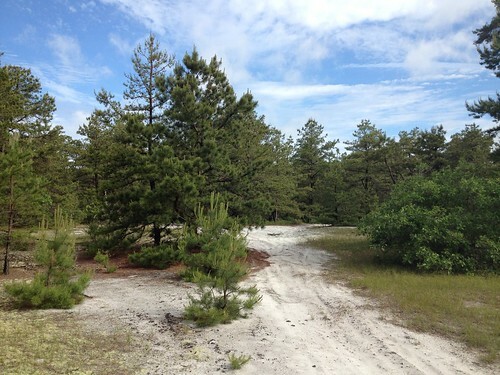 Much of the pines barrens looks very similar to this, white sugar sand with scattered pitch pine and an understory of scrub oak and highbush blueberry. 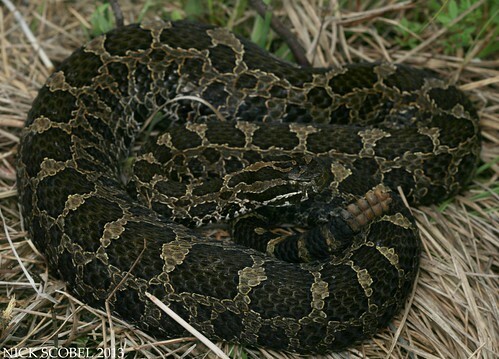 Though many unique species exist here, it is a foreboding place to herp which requires long hours in the field with little yield. The high humidity from the storm the day before had brought the biting flies out in force, the ticks were also noticeably bad. 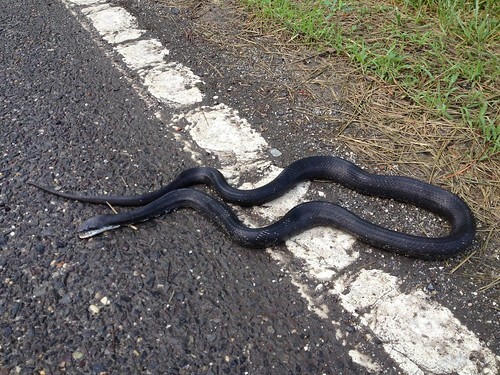 While driving between sites, I found my first snake of the trip. Unfortunately, it was in the fashion that I hate seeing snakes. 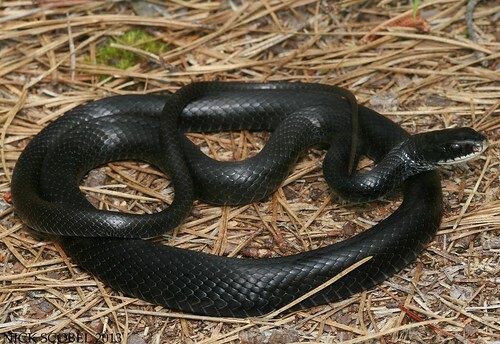 This is the only way I've seen black rats in the pine barrens, whacked on the road. The odd thing is that this snake has no visible trauma to its body, so I'm unsure as to what happened to it. It was still limp, and had clearly not been dead for very long. I stopped and flipped some cover at a few different sites and struck out so I moved on. The weather was warm and muggy and the skies were overcast, it was perfect weather conditions for snakes to be out basking. So I decided to go walk a sandy ridge that in hopes of seeing one of the more impressive species which inhabits the pine barrens. After an hour or so, I spotted this big girl. 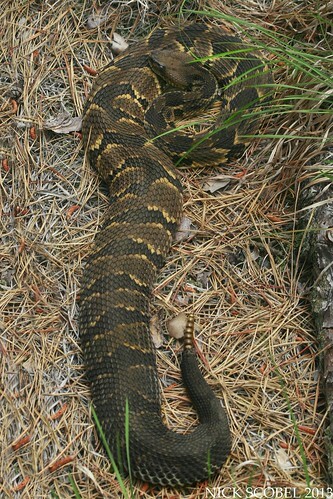 This large gravid female was only the third rattlesnake I've seen in the pines, I saw one each of the past two years. 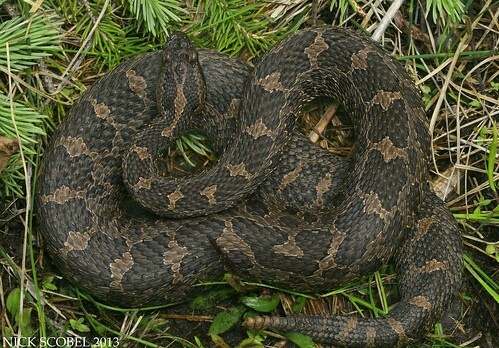 She was coiled at the base of a large pitch pine and did not move a muscle. Pinebrakes are the ghosts of this region. 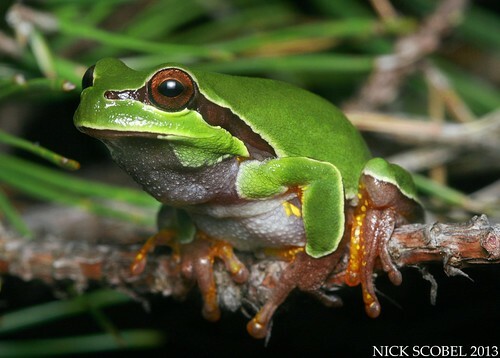 They are scarce and restricted, and most rarely encounter humans throughout their lifetime in the pine barrens. After admiring her for a few minutes I moved on to another site. After flipping through some cover, I flipped a large board and found this little gem underneath. 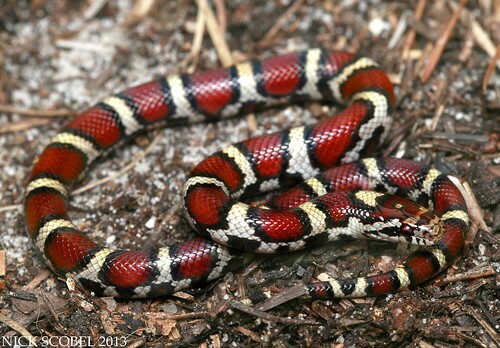 Coastal Plains Milk Snake - Lampropeltis triangulum "temporalis"
Coastals are always an exciting find and it was a great way to cap off my first day back in the pines. I had to take off early due to a recognition dinner back up north at the national wildlife refuge. After a good night's sleep, I arose early once again and headed back to the pinelands. I met up with a friend and walked some habitat and after a short while spotted this beautiful snake basking in the morning sun. 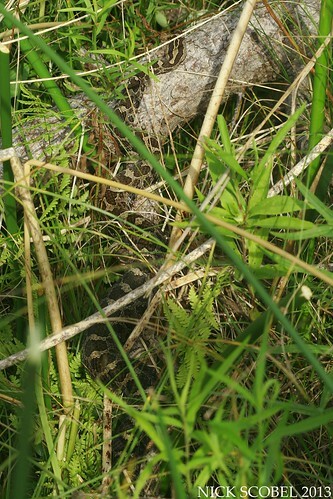 I fired a few photos of this snake from a good distance to ensure she wasn't disturbed. 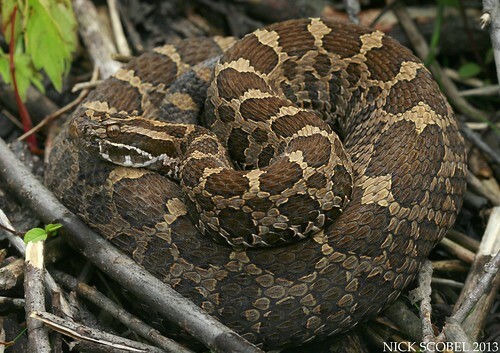 Research has shown harassment of gravid female timber rattlesnakes can cause them to abandon their gestation sites. Females select locations which are optimum for basking and also to cool off when the weather gets too hot, as thermoregulation is important while carrying young. We moved on and and searched more habitat. 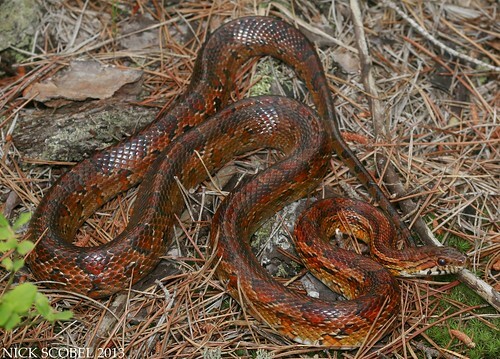 Much to my surprise, we found this male corn snake basking in the dappled sunlight. 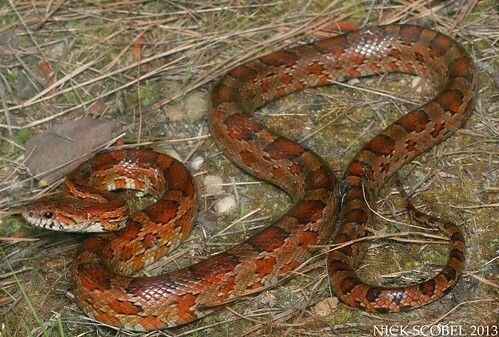 Corn snakes reach their northern range limit in the pine barrens. I only managed to observe one individual over the previous two summers, so it was exciting to find this handsome fella. After a few quick photos, we parted ways. I moved on to another sandy ridge in hopes of seeing a few more rattlesnakes. I managed to spot this large gracid female coiled in the shade. She was in the blue, and sported some very canebrake-esque serrated chevrons. Pinebrakes have sometimes been compared to the canebrakes of the southeastern coastal plain. 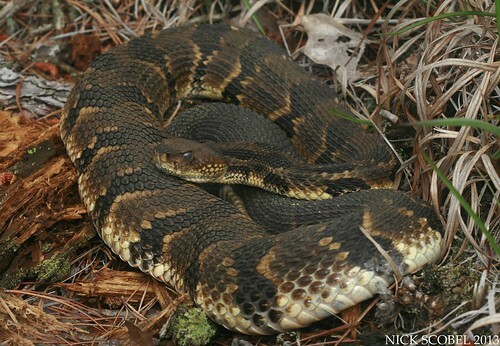 Canebrakes usually sport the same serrated chevrons, a rusty dorsal stripe, and a prominent post-ocular stripe on either side of the head. 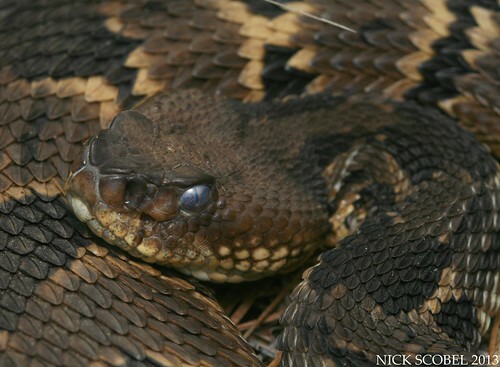 Most snakes in the pines lack these stripes, but some do have faint indications of them. I didn't bother the snake and moved on. 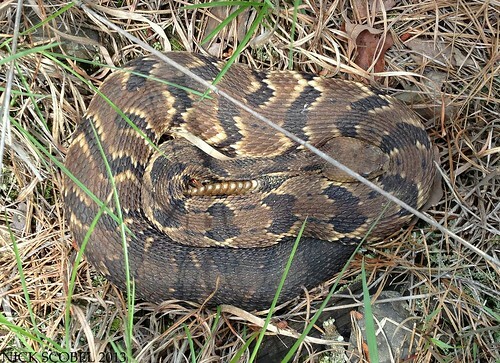 About fifteen minutes later, I spotted this big girl laid out in the pine straw. This was another large female. She did not move a muscle and allowed me to get some awesome shots with my zoom lens from a few feet away. Horridus are always an impressive species to encounter in the field and seeing multiple in a weekend was awesome. As I was leaving the area, I heard what some movement around the base of a pitch pine and managed to snag this nasty juvenile racer for a few photos. Racers are biters to begin with, but this snake was like a bat out of hell. I don't think I've ever had one bite me as many times as this one did. I got a few quick shots and moved on before I lost too much blood. As the heat of the day picked up, I went and grabbed some lunch at one of my favorite delis in the pine barrens and then made my way to another site. This large series of abandoned cranberry bogs is not only beautiful, but it's also fantastic habitat for Eastern Kingsnakes (Lampropeltis getula) and some of the larger turtle species which inhabit the pine barrens. 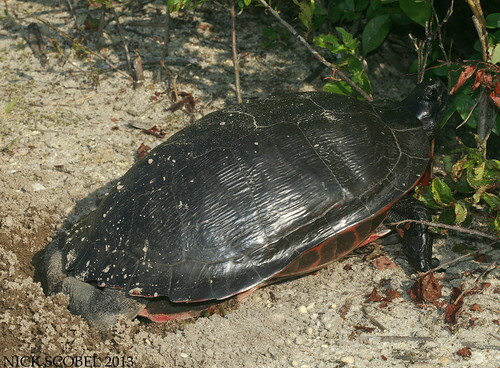 While driving the sand roads whichc criss cross the impoundments, I found several large redbelly turtles out on the move, including one nesting female. Redbellies are exceedingly skittish for their large size and often drop in from a basking location when you're more than thirty yards away. It was pretty cool to see one up close and to watch one of the females dig for a few minutes. 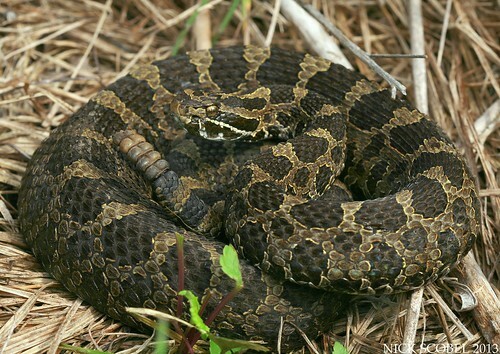 As the weather began to cool down, I went to meet up with a few good friends that I'd herped with over the past two summers in the pine barrens. We drove to a few flipping sites and flipped a few racers under cover. It was an encouraging sign, and about a half hour later we flipped this magnificent sight. I don't think any of us were ready for this flip, it will definitely be a memorable one. Corns are scarce in the pine barrens and they carry a state endangered listing in New Jersey, so seeing two in one spot like this was awesome. We gently laid the board back down and moved on. Had that been the end of the night, it would have been a great way to end the day. But as it turns out, sometimes luck is on your side. We moved on to another spot and tried flipping some more cover. I was stoked when we flipped this gorgeous hognose. 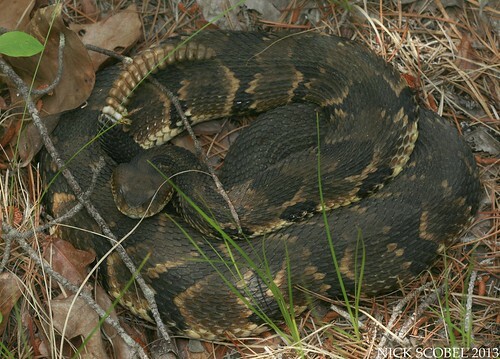 This large individual quickly retreated beneath a small pitch pine and began to hiss defensively. I don't think I've seen a wilder looking pattern or coloration myself in the wild, other then some bright yellow individuals I've seen in southeast Michigan. The snake did the usual hognose thing and after a short photo session we moved on. Later on, we flipped this gorgeous snake. After a brief photo session, we moved on as the sun began to set. The humid weather seemed to be ideal for frog activity, and so we headed to a swamp in hopes of seeing one of poster species of this region. We arrived after dark to a cedar swamp which was alive with the sounds of several different anuran species. I heard the characteristic kwonk-kwonk-kwonk and followed it to a small pitch pines and spotted a few of these colorful little fellas. This species is truly stunning. The emerald green is accented by the lavender stripes and yellow mottling on the legs. We ended up seeing quite a few individuals and closed off an outstanding weekend in the field in great way. Despite the hoards of biting flies, ticks, and chiggers, the Garden State holds a special place in my heart and I can only hope to end up there again sometime in the near future.